I decided to give Flowerbomb, or rather its flanker line, a chance hoping that after the very un-floral like contraption that was the original Flowerbomb, they would add some actual flowers to the perfume so it smelled a bit less like a very expensive Pink Sugar. In Bottle: Still smells foody though the caramel note in this one is significantly more tame than in the original Flowerbomb. I’m noticing a smooth almond note mingled with that same scent that I got from Flowerbomb. That sweet, nothing-else-but-candy scent that I wasn’t too sold on in the original. Applied: A flare up of bergamot with sweet tangerine leading the way. It’s typical of perfumes and this citrus opener didn’t happen with the original Flowerbomb that veered right into sweet territory. After the citrus digs itself out, the original Flowerbomb scent comes through with a milder caramel note riding on the waves of an almond scent that adds a bit more foodiness to the fragrance. The florals are still largely absent behind the huge wall of obnoxiously sweet candy-like accords that add nothing to this flanker’s originality. It is, essentially, Flowerbomb with some bergamot and almond. I’m not impressed. The dry down is a similar affair as Flowerbomb. La Vie en Rose is hanging on to some sweet candy scent dotted with a scrubbed clean patchouli until it has faded completely. 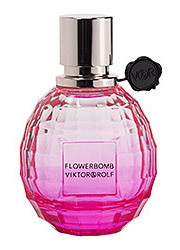 Extra: So this version of Flowerbomb’s La Vie en Rose flanker was released in 2011 and toted as being the same floral fragrance everybody’s already loved. I really wish the fine folks who keep producing this stuff would stop kidding themselves and admit that there’s very few flowers in Flowerbomb. I haven’t tried any of the other Flowerbomb flankers yet so hey, maybe they managed a floral one somewhere in there. Design: Designed much in the same way as the original Flowerbomb. Same shape. Same basic premise. La Vie en Rose has a notable deeper pink though with smaller geometric squares on the flacon’s surface. I like the design. I think it’s cute and clever. I just wish this stuff actually smelled like flowers or at least admit that it doesn’t smell like flowers at all. Notes: Bergamot, pink pepper, tangerine, freesia, lily of the valley, almond, raspberry, red berries, cashmere wood, patchouli, amber. Flowerbomb La Vie en Rose irritates me a little bit. It’s like the convenience store I go to sometimes that gouges me for instant noodles. So Flowerbomb La Vie en Rose is the instant noodles. I know it’s not gourmet, I know it’s got very little nutritional value but the convenience store will still gouge me for it anyway. Reviewed in This Post: Flowerbomb La Vie en Rose, 2011, Eau de Toilette. PS. For all my geeky perfume lovers out there, happy Captain Picard Day! This entry was posted in gourmand, Reviews By House, sweet, viktor and rolf and tagged almond, amber, bergamot, cashmere wood, freesia, lily of the valley, patchouli, pink pepper, raspberry, red berries, tangerine. Bookmark the permalink.